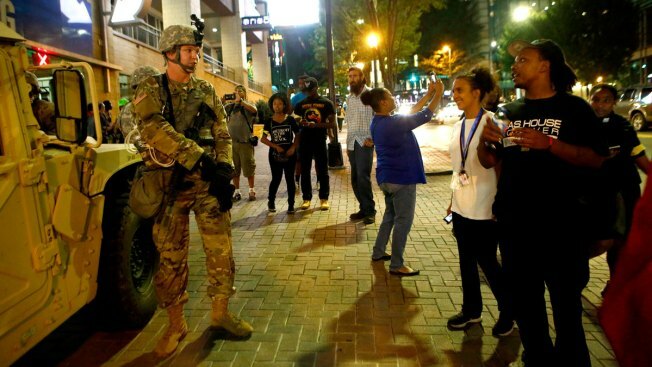 Members of the North Carolina National Guard speak with residents and visitors in Uptown Charlotte on Sept. 22, 2016, in Charlotte, North Carolina. An attorney for the family of the black man shot by Charlotte police says newly released video recorded by the victim's wife does not prove whether the shooting was justified. 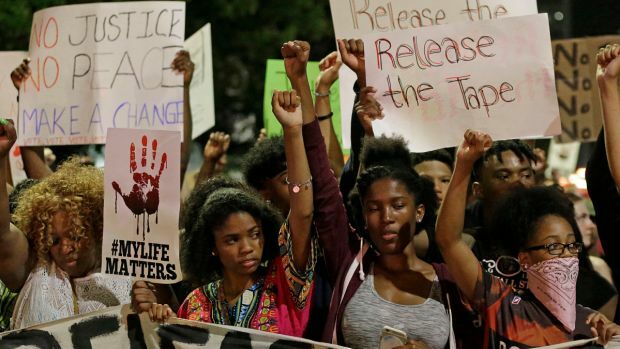 Instead, Justin Bamberg tells The New York Times, the video shows "another vantage point" of the incident, in which 43-year-old Keith Lamont Scott was fatally shot. Bamberg says he hopes Charlotte police release their own videos of the shooting. They've so far refused to do so. Police Chief Kerr Putney said there's at least one video from a body camera and one from a dashboard camera. 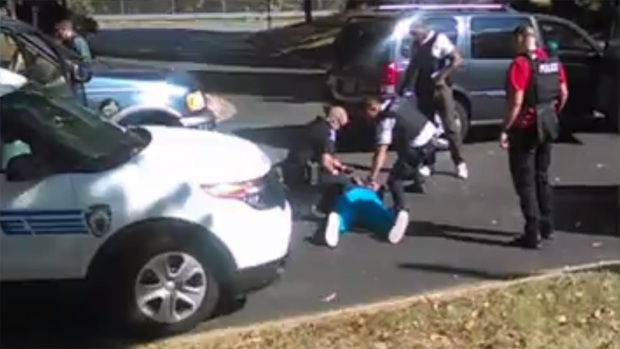 The police video could resolve wildly different accounts of the shooting. Police have said Scott refused repeated commands to drop a gun; residents say he was unarmed. It's unclear from the video shot by Scott's wife whether he had a weapon. Footage obtained by NBC News shows the moments leading up to the fatal police shooting of Keith Lamont Scott in Charlotte, North Carolina. Video of a deadly encounter shows Scott's wife repeatedly telling officers he is not armed and pleading with them not to shoot her husband as they shout at him to drop a gun. The video, posted Friday by The New York Times and NBC News, does not show clearly whether Scott had a gun. Police have said he was armed, but witnesses say he held only a book. The 2 ½-minute video does not show the shooting, though gunshots can be heard. Scott's wife tells officers that he has a traumatic brain injury. At one point, she tells her husband to get out of the car so police don't break the windows. She further tells him, "don't do it," but it's not clear exactly what she means. As the encounter escalates, she repeatedly tells police, "You better not shoot him." After the gunshots, Scott can be seen lying face-down on the ground while his wife says "he better live." She continues recording and asks if an ambulance has been called. The officers stand over Scott. It is not clear if they are checking him for weapons or attempting to give first aid. The chorus of voices calling on officials to release video of the shooting grew Friday, with Democratic presidential candidate Hillary Clinton and North Carolina's attorney general pressing for the public release. On Friday, a Clinton aide announced that the Democratic candidate would be making a stop in Charlotte on Sunday. But Charlotte's mayor pushed back, asking Clinton to give the city more time to calm down. Clinton said she intends to visit Charlotte the following week instead.